BARKLEY, Alben William, a Representative and a Senator from Kentucky and a Vice President of the United States; born near Lowes, Graves County, Ky., November 24, 1877; attended the public schools and graduated from Marvin College, Clinton, Ky., in 1897; attended Emory College, Oxford, Ga., and the University of Virginia Law School, Charlottesville, Va.; admitted to the bar in 1901 and commenced practice in Paducah, McCracken County, Ky.; prosecuting attorney for McCracken County, Ky. 1905-1909; judge of McCracken County Court 1909-1913; elected as a Democrat to the Sixty-third and to the six succeeding Congresses (March 4, 1913-March 3, 1927); did not seek renomination in 1926, having become a candidate for United States Senator; elected to the United States Senate in 1926; reelected in 1932, 1938, and again in 1944, and served from March 4, 1927, until his resignation on January 19, 1949; majority leader and Democratic caucus chairman 1937-1947; minority leader and Democratic caucus chairman 1947-1949; Democratic Policy Committee chairman 1947-1949; elected Vice President of the United States on the Democratic ticket with President Harry S. Truman in 1948; inaugurated January 20, 1949, for the term ending January 20, 1953; again elected to the United States Senate and served from January 3, 1955, until his death in Lexington, Va., April 30, 1956; interment in Mount Kenton Cemetery, on Lone Oak Road, near Paducah, Ky. Dictionary of American Biography; Barkley, Alben. That Reminds Me. Garden City, N.Y.: Doubleday, 1954; Davis, Polly. 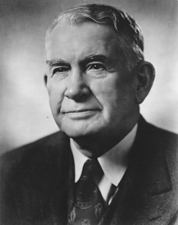 Alben Barkley: Senate Majority Leader and Vice President. New York: Garland Publishing, Inc., 1979.